Yestersay I was invited to go and visit one of my classmates to spend the day at her place. She has been wanting me to visit for the longest time and we were finally able to agree on a date! Her mum is a wonderful craftswoman who makes all kinds of things such as accessories and costumes. My friend doesn't sew but she also makes accessories. When the sun finally came out we went into her back yard and picked a bunch of apples! Guess who's going to be making pie this week! The apple trees were packed with red goodness! We brought them inside and convinced her mum to make pastries with them. She has the frozen dough so we just let that thaw and she made up the apple seasoning. While the pastries were cooking we got out all the bead, wires, pendants and gadgets they owned to make jewelry. 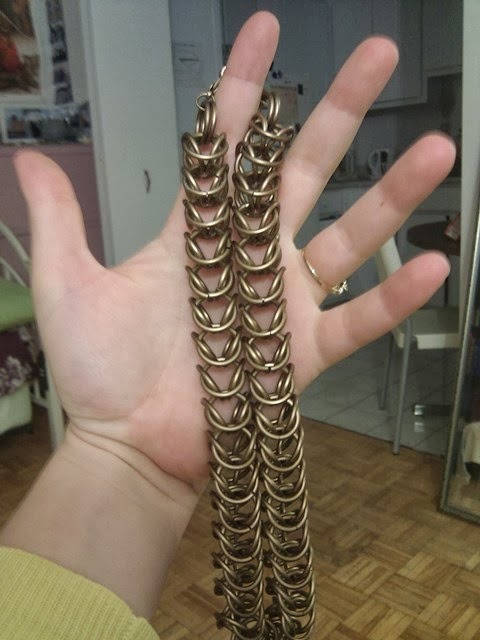 I found a chain maille book so of course I had to try it out. I had been meaning to make a chain for my pocket watch since I purchased one at Otakuthon. I decided to try the Full Persian chain. I took me a while to figure out how to get started. Once I made the first section, I couldn't figure out how to go on. The book was not very clear (at least to me). Luckily there was a portion of the Full Persian already made so I inspected it and reverse engineered it. Turns out my reverse engineering failed as I seemed to have made up a different weave. I'm proud of it none the less! My friend has been wanting to try and sell some of the costumes that they have because they simply have too many to deal with and they want people to wear them. Her boyfriend and I helped her out by modelling the costumes for them. It was so cool wearing the big hoop skirts and the heavy ball gowns. Her mum is really talented! There are so many details in these costumes and she really tried to stay true to the materials that they would have used back in the day. Needless to say they cost a lot of money to just make! We ended the day with a short game of Lord of the Ring Monopoly! I didn't even know that it existed! I lost of course but I figured that since I was Gandalf it didn't matter if I didn't have any money because Gandalf is awesome nonetheless! 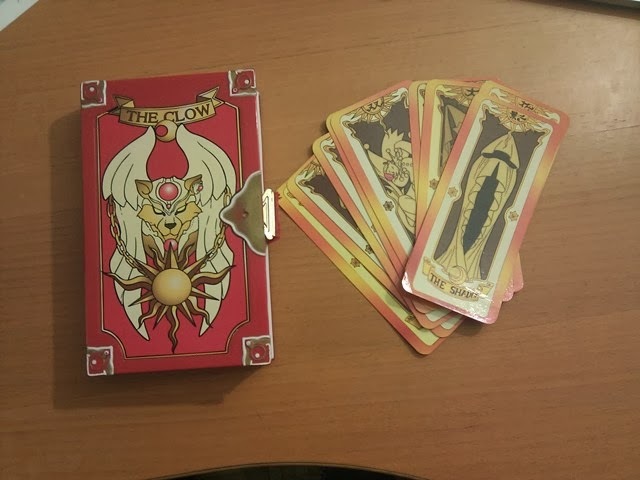 When it was time to go my friend gifted me with her old set of Clow cards. I was totally thrilled as I have been meaning to do a Cardcaptor Sakura Cosplay! Now I shall have to make that costume! Maybe more than one who knows!